Soledad O'Brien is really trying to redeem herself in my eyes...LOL! After the 'Black in America' series I wasn't much of a fan of homegirl, but she's winning me over. Last week, Soledad had the editor-in-chief of Breitbart.com, Joel Pollak, on her show discussing the 'explosive' video of President Obama hugging another black man who happened to be the late, great professor Derrick Bell. It was this video that was to show how radical the President is because he was willing to embrace the author of Critical Race Theory. During the show, Soledad and Pollak got into a heated debate over Critical Race Theory. Let's just say it was very interesting and you can watch the exchange by clicking here. 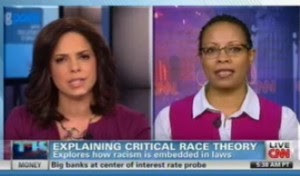 Since Soledad couldn't convince Pollak the err of his ways she decided to have Professor Dorothy Brown, author of Critical Race Theory: Cases, Materials and Problems, on her show to explain Critical Race Theory. Watch the video below to see the entire exchange. Nice self pwnage there. Dorothy Brown says "It’s nothing about white supremacy. When I hear “white supremacy” I think of the Ku Klux Klan. Critical Race Theory is the opposite of that." Let me see. In the writings of one Dorothy Brown, "Although CRT does not employ a single methodology, it seeks to highlight the ways in which the law is not neutral and objective, but designed to support White supremacy and the subordination of people of color...First, critical race theory seeks to expose the entrenchment of White supremacy"